Today I am super excited because I get to share one of my top 5 favorite restaurants at the Walt Disney World Resort. 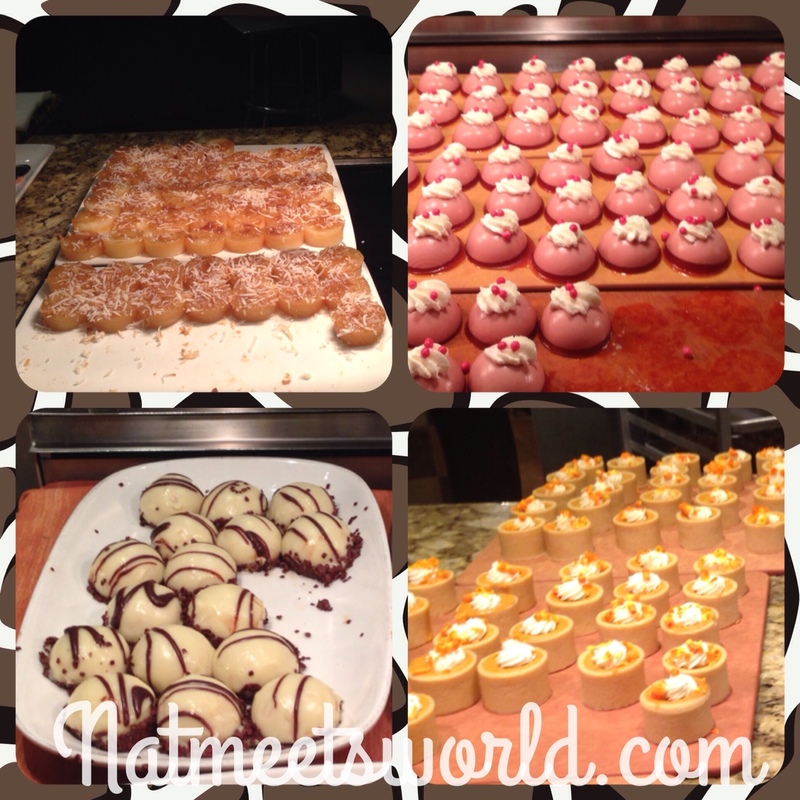 Boma at the Animal Kingdom lodge is a must do when dining at Disney. 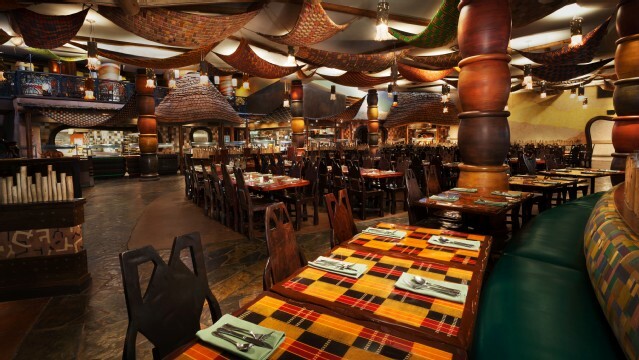 It’s authentic African flavors are unique, and can’t be found at any other restaurant on the Disney property. It’s culture and style is reflective of the resort, and will allow you to ‘taste’ your way through Africa. I wrote about Boma’s amazing breakfast last month, but now I’m going to share my dinner experience with you. 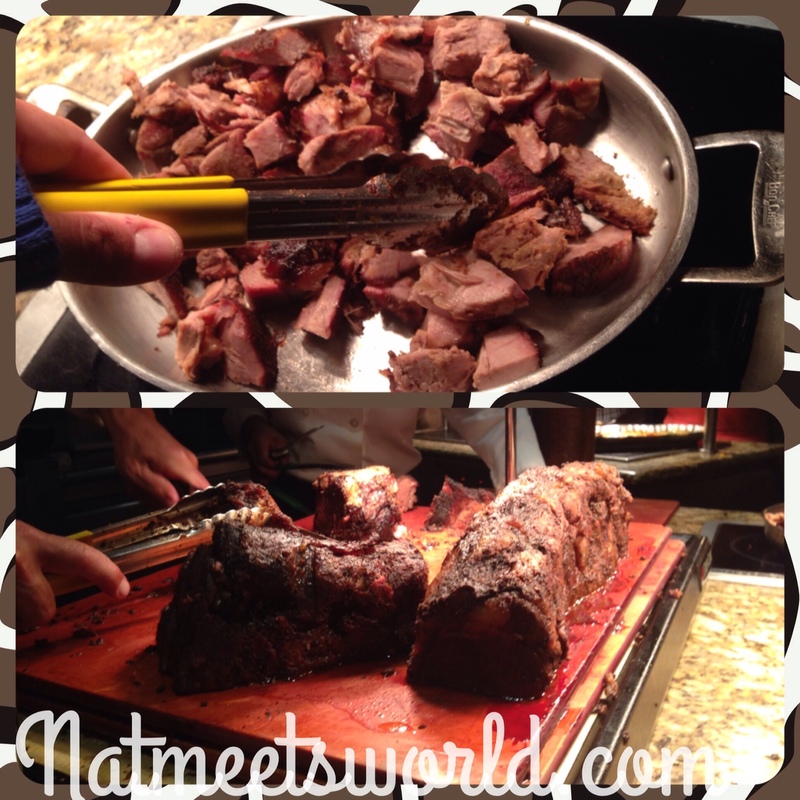 Boma’s dinner is just as good if not better than their breakfast. 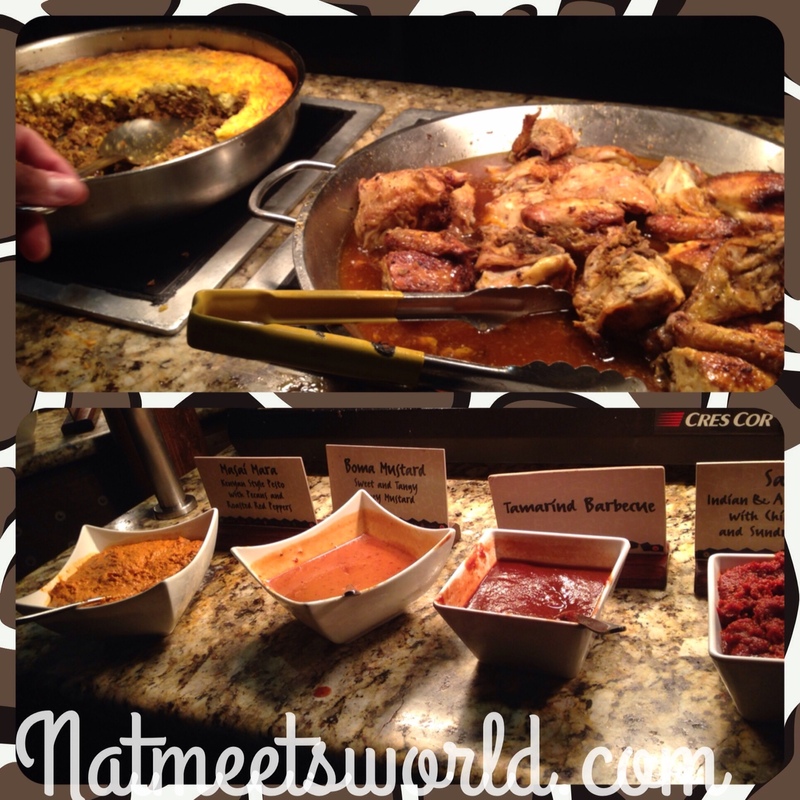 It is also a family style buffet, so I recommend you eat up, and then you can head on over to movie night by the pool! 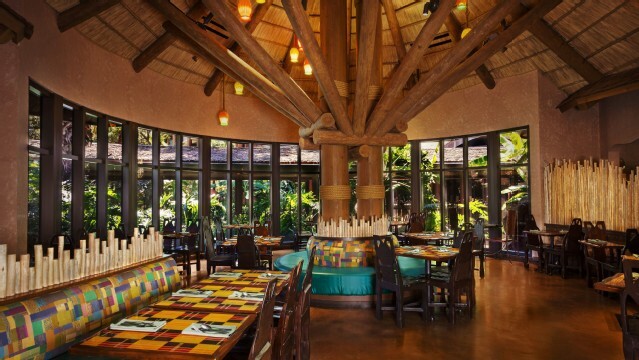 The atmosphere is very detailed and traditional to the African theme that the Animal Kingdom Lodge entails. To start, Boma offers several different kinds of food that I have never heard of because it is prepared as authentic African food. 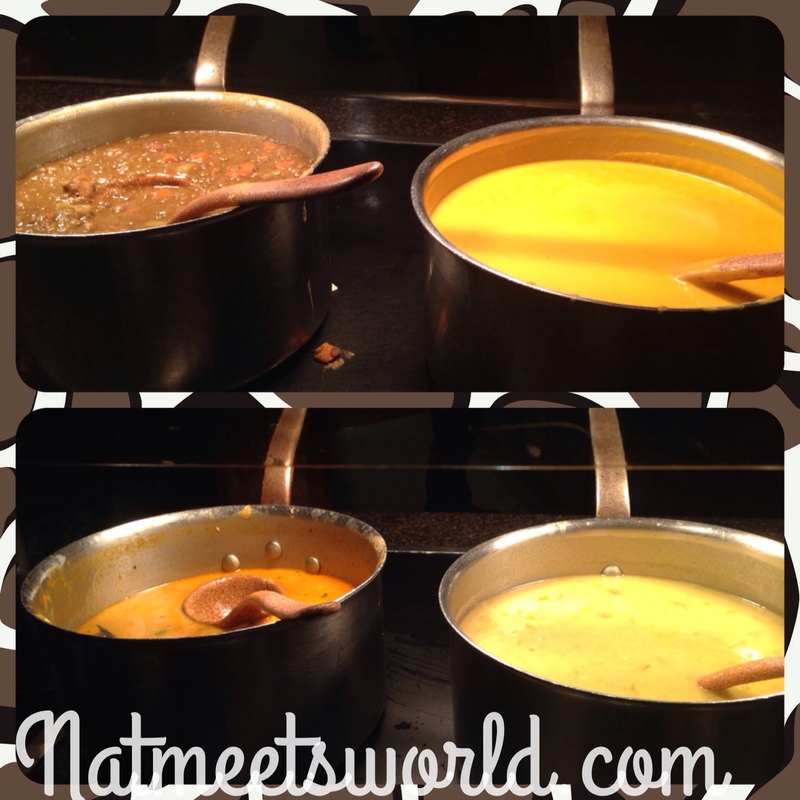 If you are a soup lover, your smile will expand when you see the various soups they offer as your appetizer. My absolute favorite was the carrot-ginger soup (you’re either going to love it, or hate it). It has a sweet taste to it and I have never had anything like it before. The carrot-ginger soup is on the top right corner of the picture. Delish! Some of the other soups they offer are mulligatawny, curry-cauliflower, seafood gumbo, curried coconut seafood, chicken corn chowder, harira, mushroom, coconut chicken curry, lentils and sausage, zanzibar crab, and butternut squash (whoo…that was a mouthful!). If you are a salad lover, or vegetarian, you will be excited to know that there are also a plethora of salad options as well. I am not a salad chick, but I did try it and I will say that I wish they sold their mango dressing in bottles, because I would have purchased the entire stock of them. It was absolutely delish! Don’t miss out on this dressing. Top pictures show a mixed green salad with dressing options. The bottom pictures show the various style salads they offer. The salad options are watermelon rind salad, chicken salad with chili cilantro, Tunisian couscous salad, tabbouleh, spinach and quinoa salad, apple jicama salad, pasta salad, kool slai, Ghana tomato salad, pearl couscous salad, artichoke and lemon salad, avocado, grapefruit, and papaya salad, and lentils and hearts of palm salad (another mouthful, I know). 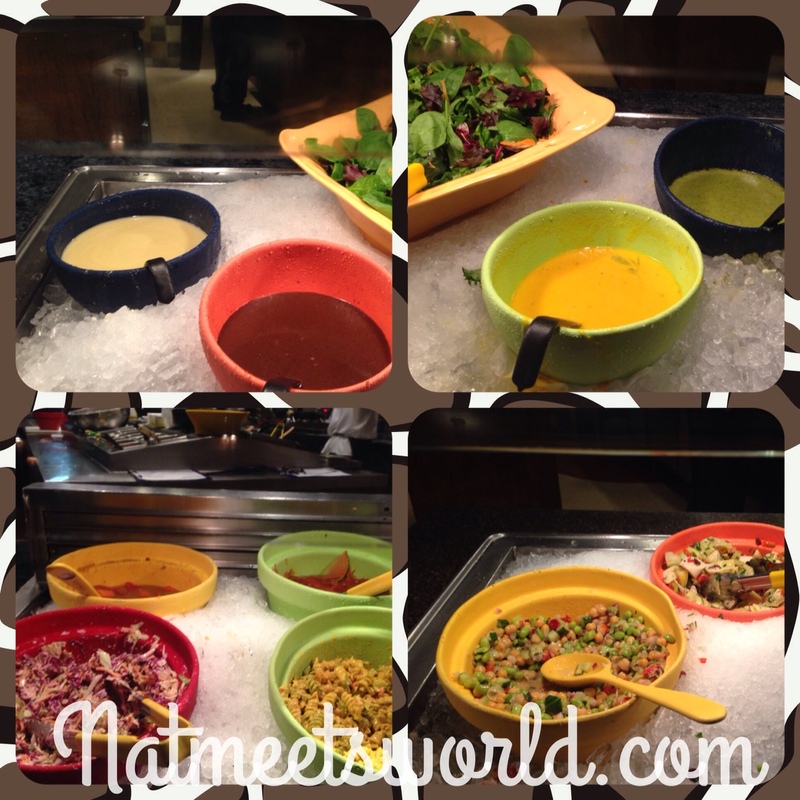 My family and I are carnivores, and I love that Boma offers a variety of meats and sauces to compliment each one. 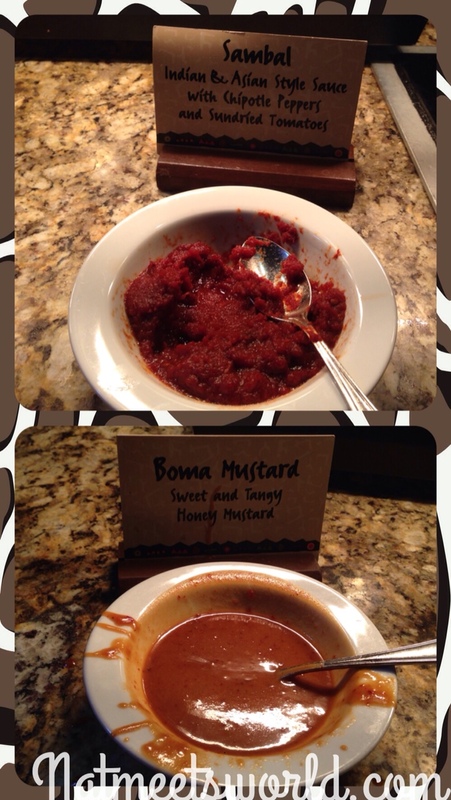 There are sweet,tangy and spicy sauces to sample, but my favorite was their Boma mustard. It was great on all of the different meats I ate. Many sauces are also infused with Indian spices. Sauces are in the picture below and are spread out in the meat/fish area. The side items vary from seasoned and roasted veggies to different flavored hummus and pita (see pic below). 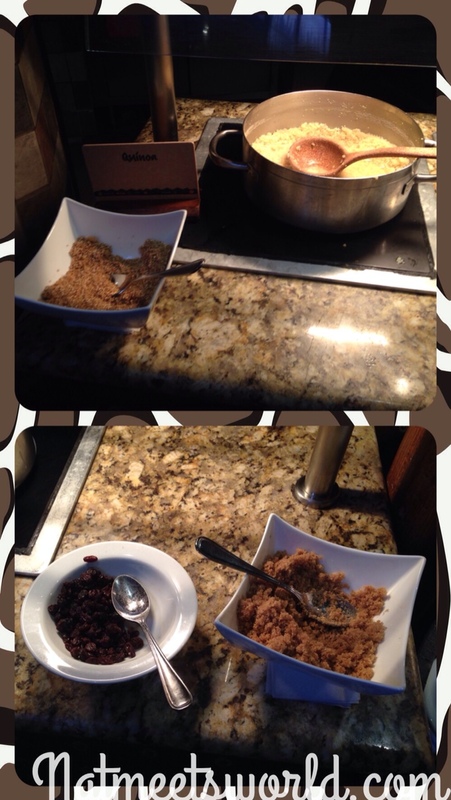 There is also quinoa and toppings that you can incorporate in your quinoa to spice it up. The other side dishes include various African dishes. Some of these food choices sound like they are not kid friendly, but not to worry. There is a station for the little love bugs as well. 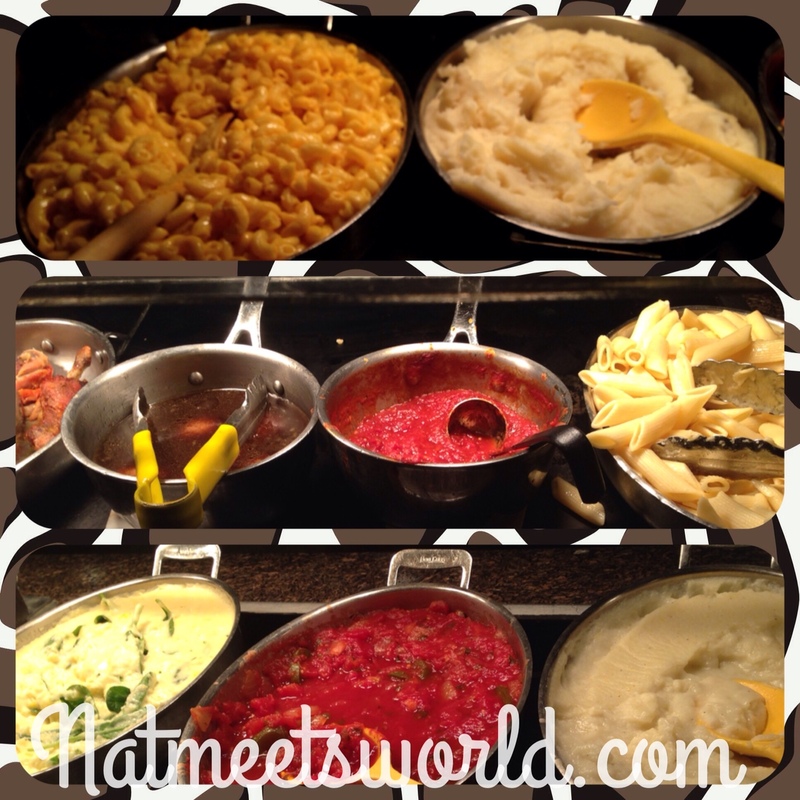 This station includes mac and cheese, baked chicken legs, mashed potatoes, and pasta with red sauce. Don’t be afraid to indulge in the carbs too, they are creamy and scrumptious! Zebra domes The MUST try here are the zebra domes. They are so out of this world that they made Disney’s top 5 desserts on the Disney blog. These zebra domes have an amaretto mousse inside and are not sold anywhere else. 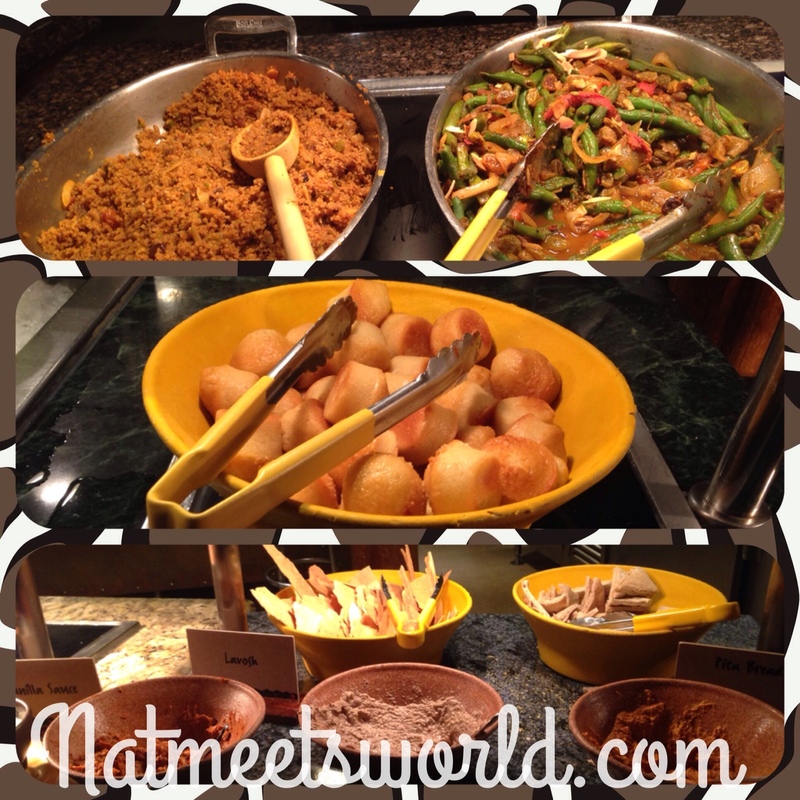 After eating 5 domes, I was told by the waiter that they are also sold in fours at The Mara, the quick service restaurant on the Animal Kingdom Lodge resort property. The famous zebra domes are on the bottom left corner of this picture. 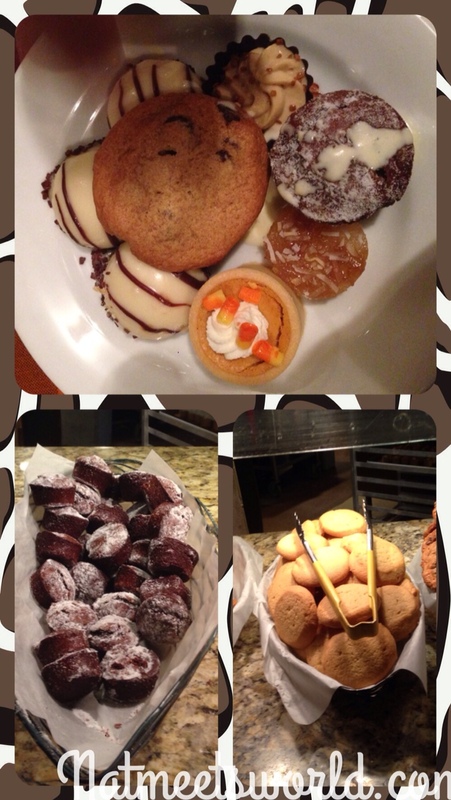 There are also other small seasonal desserts, such as the pumpkin pie pieces in the above picture. You may have more options when you arrive because of the seasonal treats. Top picture: my plate of goodies. Bottom picture: assorted brownies and cookies. Boma also offers specialty made cocktails and alcoholic beverages as well as a variety of soft drinks, juices, water, coffee, espresso, lemonade, and water. Throughout the dinner, the hostesses used African drums to play music every 30 minutes or so while they zigged and zagged through the tables. It was great to see the big and little love bugs clapping their hands and smiling to the beat of the drums. I felt this gave it a real authentic experience. 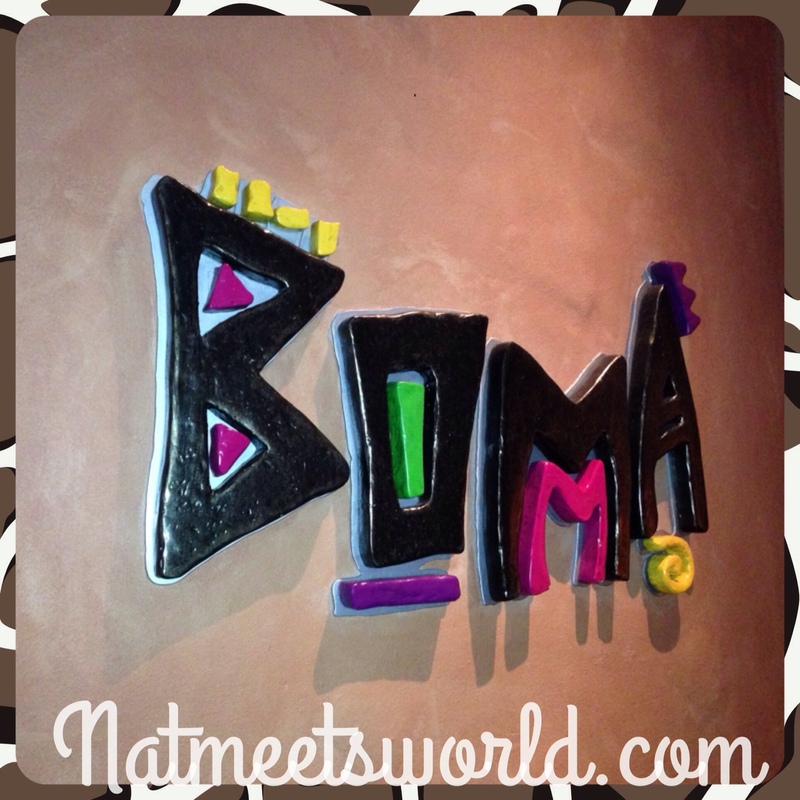 The next time you visit the happiest place on earth, check out Boma for a unique dining experience. You won’t regret it. I can’t wait to go back! Boma is ranked at $$ ($15 to $29.99) per adult and $$$ ($30 – $59.99) per adult depending on what time of the year you visit. Deal alert: You can use this restaurant on the Disney dining plan. Annual Pass Holders also receive a discount, so be sure to present your annual pass to your waiter.